After worrying and wishing for some time, I finally knuckled down and somehow managed to get a ticket at the re-sale in April of 2011. 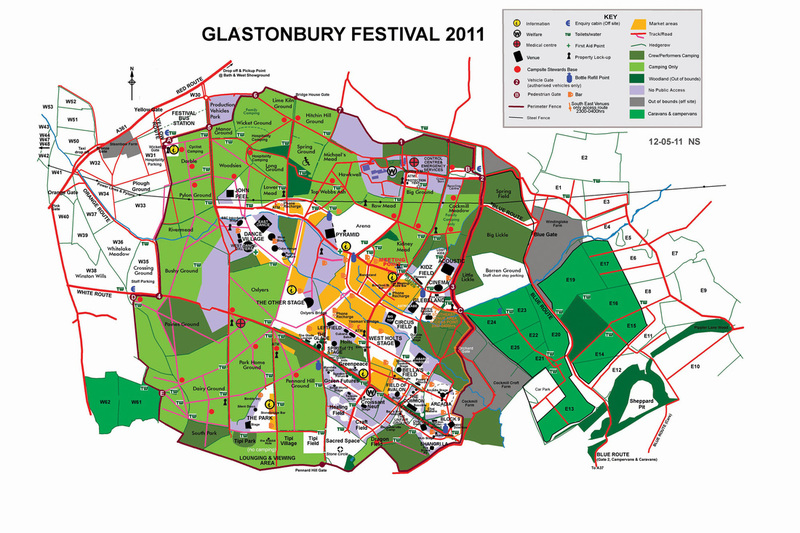 For the uninitiated, the Glastonbury Festival of Contemporary and Performing Arts is an annual (well, most years) four day event held on Worthy Farm in Pilton, Somerset in June. The weather is notoriously fickle, being around the time of the Wimbledon Tennis tournament, and the hilly site becomes a quagmire at a drop of rain and 150,000 sets of boots walking around. All I knew was that Coldplay, U2 and Beyonce were headlining the Pyramid Stage that year. As the confirmed acts was rolled out, it became clear that the bill would suit my taste down to the ground. I really did not know what to expect of the event and I figured that either I would love it or hate it. As it happened I loved it and was left wishing that I had gone years ago and that I would get to the festival as often as I could. It is the most tolerant place on the planet (much is probably THC induced). If you don't want to see an act, you will not be greeted by a rant of "Why not? They are a massive act now...", more likely someone will ask "Who will you be seeing ?" Hugs, kisses and high-fives abound for common place courtesies to people who are only there for the same reason as you - to have a great time. The food is good and the Somerset Cider Bus a joy. If you don't like what you are seeing or hearing, you can easily move away to another stage for something else. There will be something for you when you want it. You enter a mind-set which means that if you hear something which catches your notice, it really doesn't matter that you don't get to see an individual act. In any case, it is a long way to that stage, anyway. The long drop toilets hold no fears for me - I would not go in an enclosed plastic "turdis" by choice. It is good that at such a massive event, you can look around and NOT see wall-to-wall adverts for a brewery, phone company or massive corporate. What you do see are adverts for Oxfam, Greenpeace and WaterAid - the world is a better place because of this. I would go again at the drop of a hat - the only obstacle is actually getting a ticket. I have tried at every sale since, but failed miserably. This last sale (for 2014) sold 150,000 tickets in about 90 minutes. Both resales were over and done is 15 minutes. Current ticket price is £210, which may seem a lot. I argue that it is not when compared to the Rolling Stones charging £95 for a concert in Hyde Park, or U2 charging £65 for a stadium gig. You get three and a half days music and entertainment and entry to potentially the best party you will go to. A bargain to my mind.